Otherwise known as the 7.5cm Sturmgeschütz III, the 7.5cm Sturmgeschütz 40 was produced in three SdKfz 142/1 versions as the definitive models of the assault gun series based on the chassis of the PzKpfw III medium tank. 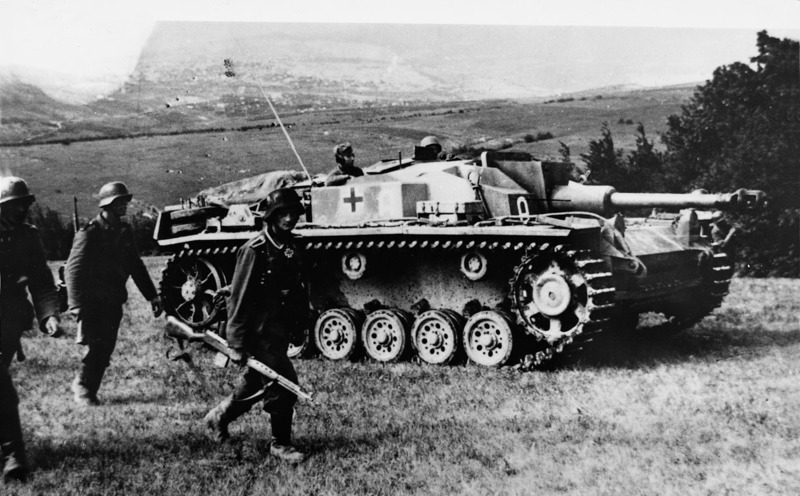 The first variants of this four-man vehicle were armed with the 7.5cm KwK L/24 short-barrel gun, and were the StuG III Ausf A that was produced in 1940, the StuG III Ausf B/D with chassis variations, and the StuG III Ausf E of 1942 with an additional armoured pannier on the right-hand side for radio equipment when used as a unit commander’s vehicle. The StuG 40 Ausf F that appeared early in 1942 was a development with a cooling fan in the fighting compartment and the more potent 7.5cm Sturmkanone 40 L/43 assault gun development of the KwK 50 tank gun with 54 rounds, while the StuG 40 Ausf F/8 had the longer L/48 version of the same gun. Late in 1942 there appeared the StuG 40 Ausf G, based on the chassis of the PzKpfw III Ausf J tank with the L/48 gun and, in place of the original commander’s hatch, a cupola with seven episcopes and an armoured shield for the local-defence machine gun and, on later vehicles, armoured skirts. The final model was the StuG 40 Ausf G (nicknamed the sow’s head) with thicker armour and a cast gun mantlet. The data applies to the StuG 40 Ausf F.